Whether youre a first-time cruise traveler looking to test the waters or an old salt, its time to book a cruise. With more ships afloat offering an incredible array of itineraries, amenities, and activities, the cruise news is better than ever. Value is only a part of the reason cruise travel is more popular than ever. The cruise lines have created floating resorts that are essentially all-inclusive. But large new ships with virtually every offering imaginable arent the only reason interest in cruise travel is high. Smaller and more classic ships continue to lure veteran cruisers, as does the increase of new and interesting ports. Homeland cruising--using North American ports as both embarkation/debarkation points and ports of call--is more popular than ever, with more than 30 ports now a part of the North American cruising scene. In addition, luxurious private islands developed by the likes of Disney Cruise Line, Holland America, Costa, Princess, and Royal Caribbean provide unique Caribbean getaways, while new ports of call like the one developed by Carnival Corporation on Grand Turk keep cruisers coming back for more. When the sparkling new Crown Princess of Princess Cruises set sail this past summer from the (also new) cruise terminal in Brooklyn, NY, it made a statement about big ships, unique North American ports, and the growth of the cruise industry. The new Princess gem carries 3,080 passengers and an unbelievable array of amenities, including two specialty restaurants, balcony dining, a wine bar, the huge Movies Under the Stars screen, several adults-only areas and the Brooklyn Balcony Nosh when the ship departs. In April, Princess fans will welcome the Emerald Princess, sister ship to the Crown. Of course, Carnival Cruise Lines, the largest line in the industry, continues to lead the way for both first-time and long-time cruisers. The cruise news for Carnival includes: first-ever Greek Isles cruises, the resumption of service out of New Orleans and Mobile, Ala., continuation of the annual Presidential Wine Club Cruise (hosted by wine collector and Carnival president/CEO Bob Dickinson), the benefit-packed Concierge Club for Carnival passengers with 10+ cruises and implementation of Chef Georges Blanc Signature Selections on menus. The 21-ship line will add the Carnival Freedom in February. The Queen Victoria took to the sea for Cunard Line in December. The quintessential Cunard liner includes innovations like private viewing boxes in the Royal Court Theater, alfresco dining for Grill guests, a two-story library with 6,000 books, and a floating museum of Cunard memorabilia. Of course, the Queen Mary 2 and the grande dame Queen Elizabeth 2 will continue to offer an array of itineraries in 2007, including world cruises for both ships and several shorter four-day sailings for the QM2. The luxury category also saw the re-branding of Radisson Seven Seas to Regent Seven Seas in 2006. For 2007, Regents four upscale vessels will offer a new all-inclusive liquor policy, 21 new ports of call, themed enrichment programs from ship to shore, and the new Regent Travel Concierge Program o specially created insider guides to most of Regents worldwide ports of call. Crystal Cruises cruised into 2007 with a completely refurbished Crystal Symphony, including redesigned staterooms and public spaces. After $23 million of enhancements, the new Symphony joined Crystals Serenity for a 2007 season or roaming the world in elegance. With its Signature of Excellence program enhancing stateroom amenities, dining, spa and fitness facilities, and technology (including some of the best internet cafes afloat), Holland America Line is continuing the Dutch tradition of civilized cruise travel while continuing to add modern offerings. For instance, Holland America is increasingly popular with contemporary families--with more than 25,000 families aboard the lines 13 ships each year. Now four years old, Discovery World Cruises is another line worth discovering, with its flagship Discovery heading to Antarctica, the Galapagos Islands, South America, the South Pacific, Europe and Scandinavia. The ships longer Grand Voyages are a great value for those who have the time. Royal Caribbean International continues to make news with innovative onboard offerings and more. The lines second Freedom-class ship, Liberty of the Seas (debuting in May), will reflect the same freedom of choice and experiences as the 2006-introduced sister ship, Freedom of the Seas (the ships will share the worlds largest designation). The 3,600-passenger Liberty will mirror the Freedom with signature features like the FlowRider® surfing simulator and cantilevered whirlpools suspended 200 feet above the ocean, but the ship will also continue the lines legacy of to-be-revealed unexpected features. The Liberty will sail seven-night alternating itineraries from Miami, while Royal Caribbean continues concentration on North America with expansion of offerings from Cape Liberty, NJ; Philadelphia; Norfolk, VA; Galveston, Texas; Alaska; and more--as well as shorter cruises out of Miami and longer itineraries in Europe. Popular with both kids and kids at heart, Disney Cruise Line has enhanced both of its ships and added European itineraries out of Barcelona (10- and 11-night Mediterranean cruises that visit Spain, Italy, and France). Highlights onboard include adults-only areas and dining, a jumbo LED poolside screen and an expanded spa. There are highlights off the ship as well--Castaway Cay, Disney's private island in the Bahamas, will see the addition of the 175-foot Flying Dutchman ghost ship film prop from Pirates of the Caribbean: Dead Mans Chest. Disneys private island is so popular that some itineraries actually include two separate stops. Long known for world-class cuisine and service, Celebrity Cruises will continue its European expansion in 2007 and 2008, including several enticing transatlantic voyages, a variety of Mediterranean and Northern Europe itineraries and cruise-land combinations that extend a European vacation. In addition, Celebritys beloved Century is now sailing Europe and the Caribbean after a $55 million makeover in 2006 that brought the addition of 314 new balconies (a first for an existing cruise ship). Alaska continues to be a very popular spring-to-fall destination, with long-time leaders including Princess, Holland America, Celebrity, and Royal Caribbean. In addition, a smaller ship experience is available with Cruise West. One of the original companies to offer Alaska cruise travel, Cruise West offers Alaska from the Inside Passage to the Bering Sea, exploring remote islands, native cultures and awe-inspiring wildlife with seven of the lines distinctive small ships (just 78-138 guests). Cruise West, with an incredibly high number of repeat passengers, also offers itineraries in California Wine Country, the Great Lakes, Central America, the South Pacific, Asia and more. Small ship fans should also check out Majestic America Line, which was recently formed by the merger of Delta Queen Steamboat Company and American West Steamboat. The newly-named company now features a fleet of six U.S.-flagged American-crewed cruise ships (including the Delta Queen, a national historic landmark), which ply the coastal and inland waterways and rivers of America. In 2007, Majestic will offer more than 215 departures and call at 70 port cities and communities in 19 different states. Windstar Cruises offers another small ship alternative with a twist, thanks to its three-ship fleet of luxury motor sailing yachts. In the past couple of years, the lines well-received Degrees of Difference initiative (focusing on dining, accommodations, service, destinations and activities) has added amenities and enhancements to the 308-guest Wind Surf and 148-guest Wind Star and Wind Spirit. For 2007 and 2008, the third phase of the program will see the focus shift to structural and technical improvements for all three ships (from the addition of new suites to many renovations and enhancements). For 2007 and beyond, Windstars sailing vessels head to many smaller ports of the Caribbean, Costa Rica, the Panama Canal, the Mediterranean, the Greek Isles, as well as sailing on enticing transatlantic voyages. 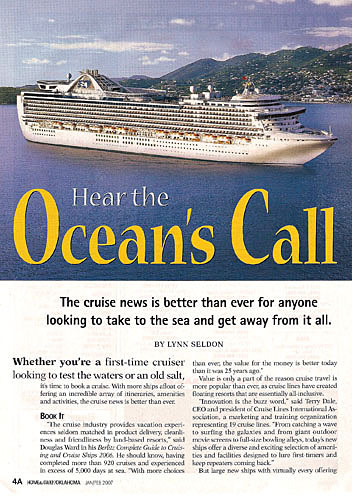 As can be seen, the cruise news is definitely good for anyone looking to book a cruise for 2007 and beyond. Whether its a new ship or classic ship, a luxury or value-packed line, or a cruise with lots of sea days or none at all, a AAA travel adviser can help anyone choose the right cruise.